TIME: Facebook is undergoing a huge period of growth. With more than 150,000 new users signing up daily, it is growing three times as fast as rival MySpace. What do you attribute that spike to? Zuckerberg: For a while we actually constrained our growth. We made it so that only people in college could sign up. Initially it was only available to people at Harvard, where I was at college. We rolled it out to all the colleges, all the high schools, then a bunch of companies could sign up, and now everyone can sign up. It may seem like the growth is really accelerating at a crazy rate, but it's actually been growing and doubling about once every six months for quite a while. TIME: Is Facebook's popularity connected to its focus on authenticity? On your site, misrepresentation of your real self is a violation of company policy. Zuckerberg: That's the critical part of it. Our whole theory is that people have real connections in the world. People communicate most naturally and effectively with their friends and the people around them. What we figured is that if we could model what those connections were, [we could] provide that information to a set of applications through which people want to share information, photos or videos or events. But that only works if those relationships are real. That's a really big difference between Facebook and a lot of other sites. We're not thinking about ourselves as a community  we're not trying to build a community  we're not trying to make new connections. TIME: Why do you describe Facebook as a "social utility" rather than a "social network?" Zuckerberg: I think there's confusion around what the point of social networks is. A lot of different companies characterized as social networks have different goals  some serve the function of business networking, some are media portals. What we're trying to do is just make it really efficient for people to communicate, get information and share information. We always try to emphasize the utility component. TIME: In September you rebuffed Yahoo's offer to buy Facebook for nearly $1 billion. Before that, Viacom put up a $750 million bid. And about two months ago you clearly said Facebook would stay independent. Is that still the plan? Zuckerberg: That has always been the plan. As a company we're very focused on what we're building and not as focused on the exit. We just believe that we're adding a certain amount of value to people's lives if we build a very good product. That's the reason why more than half of our users use the product every day  it's a more efficient way for them to communicate with their friends and get information about the people around them than anything else they can do. We're not really looking to sell the company. We're not looking to IPO anytime soon. It's just not the core focus of the company. TIME: So, if Facebook isn't for sale and there's no IPO in the works, how do you intend to satisfy your investors who put a total of $38 million into the company? Zuckerberg: Well, they're actually really supportive of this. What they want is to build a really great company, too. And if you think about the timeframe over which this has happened  we took our venture round from Accel Partners just about two years ago  they're not in a rush. We have plenty of time to build something good. 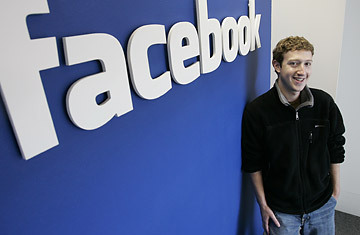 TIME: Facebook is looking to hire a stock administrator, isn't that a signal you're preparing for an IPO? Zuckerberg: Well, no. [Pause.] I mean, we grant options to all of our employees. At this point we have more than 250. It's a core part of compensation, so you want to make sure you get it right for people. At some point in the future, if we get a chance to go down that [IPO] path, it will be valuable to have that  it's a part of building out the company. I think it's funny that people are paying so much attention to that. TIME: The frenzy surrounding Facebook seems to have intensified quite dramatically over the past several months. What do you think is behind the company's newfound cachet? Zuckerberg: I think the most recent surge, at least in the press, is around the launch of Facebook Platform. For the first time we're allowing developers who don't work at Facebook to develop applications just as if they were. That's a big deal because it means that all developers have a new way of doing business if they choose to take advantage of it. There are whole companies that are forming whose only product is a Facebook Platform application. That provides an opportunity for them, it provides an opportunity for people who want to make money by investing in those companies, and I think that's something that's pretty exciting to the business community. It's also really exciting to our users because it means that a whole new variety of services are going to be made available. TIME: What's your grand plan for the company? How do you see it evolving over the next three to five years? Zuckerberg: It's tough to say, exactly, what things will look like in three to five years, but there's a lot of work to do in just moving along the path that we've already set out. Right now we have 30 million active users on Facebook. There's a lot more to go. And there a lot of different applications that are going to be developed to allow people to share information in different ways. I would expect the user base will grow [and there will be] more ways for advertisers to reach people and communicate in a very natural way, just like users communicate with each other. All these things will just get more and more evolved. TIME: Beyond Facebook's exclusive advertising deal with Microsoft, which gives the software giant the right to sell ads on the site, what are some of your ideas about monetizing your 30 million users? Zuckerberg: Advertising works most effectively when it's in line with what people are already trying to do. And people are trying to communicate in a certain way on Facebook  they share information with their friends, they learn about what their friends are doing so there's really a whole new opportunity for a new type of advertising model within that. And I think we'll see more in the next couple months or years on that. Zuckerberg: Right now a lot of our growth is happening internationally. We have more than 10% or 15% of the population of Canada on the site. The U.K. has a huge user base. We haven't translated the site yet, but that's something we're working on and it should be done soon. What we're doing is pretty broadly applicable to people in all different age groups and demographics and places around the world. TIME: You recently took off for a summer vacation, what did you do? Zuckerberg: Hang out with my family. TIME: What's a typical day like for the guy who founded Facebook in his Harvard dorm room just three years ago before becoming a full-time entrepreneur? Zuckerberg: I wake up in the morning, I walk to work because I live four blocks from one of our offices, and I work, meet with people, and discuss things all day, and then I go home and go to sleep. I don't have an alarm clock. If someone needs to wake me up, then I have my BlackBerry next to me. TIME: You're a 23-year-old Silicon Valley CEO. How do you deal with all pressures that come along with running a hyper-fast paced, high-profile technology company? Zuckerberg: I was watching an interview with Steve Jobs the other day, in which he said that 'In order to be doing something like this, you have to really, really like what you're doing, because otherwise it just doesn't make sense.' The demands and the amount of work that it takes to put something like [Facebook] into place, it's just so much that if you weren't completely into what you were doing and you didn't think it was an important thing, then it would be irrational to spend that much time on it. Part of the reason why this is fun is because we've managed to build a team of really smart people who come from different backgrounds and have different experiences and think in different ways. People constantly try to put us in a bucket: are we trying to sell the company? What are we trying to do? What is the business strategy? People are often more interested in why we're hiring a stock-options administrator. Whereas for me and a lot of people around me, that's not really what we focus on. We're just focused on building things.